Floating somewhere off the western coast of Scotland, and lapped by the salty sea, an enchanted isle drifts. Sometimes shrouded in soft mist and clouds, sometimes revealed by light, it captures the heart and lures us closer. There are many old tales of the voyages of brave heroes and saints who took to the waves in search of the treasures of the magical otherworld and its fairies. Perhaps this is Tir nan Og, the fabled Land of Youth where spring hides from winters grasp, and Angus Og sings to the birds of the love in his heart…. But don’t wait too long, in a moment the tide will turn and the light will vanish and with it all the magic. Go now in this moment as the thought flows through your head trailing magical threads in beautiful patterns among the paths and waves of your mind. This entry was posted in Celtic, mythology, relaxation and tagged Celtic, island, magic, myths, reflection, scotland, stories, Tir nan Og, travel. Bookmark the permalink. So your wand is here again, Seonaid…And we all let ourselves go…I’m so glad to hear about the Right to Roam too – this sounds like what we have in Sweden as well. Thanks Tina, I do love to sprinkle a little magic here and there to keep the world interesting 🙂 I’m heading north again this week…so hope to catch some more Skye magic to share! Ah – we all would love it! Glorious! Emerging from the mists for a magical moment. I can imagine the fair folk there. 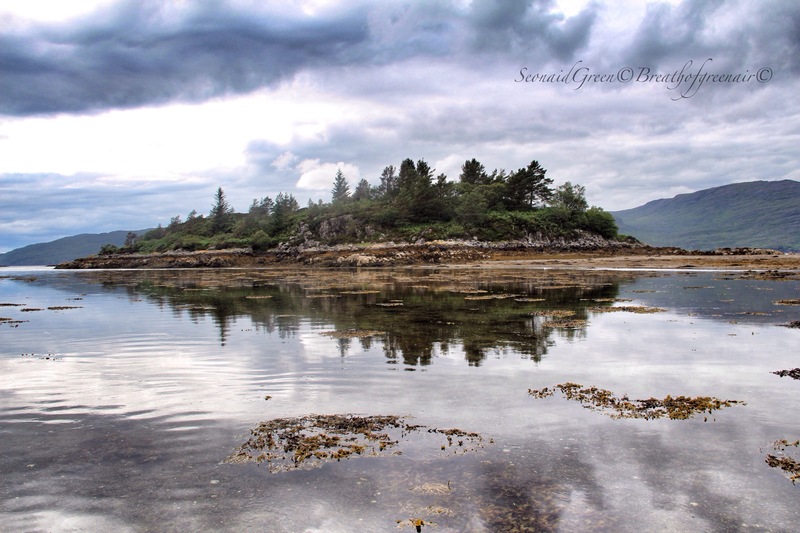 Seonaid, I so love this image … for the colors, the reflection, the clouds. It is magical, your words and those gentle ripples leading us over into a land of wonder. A very big adventure to be allowed to camp without adults supervising!! The romantic nature of the idea of an enchanted ‘now you see it; now you don’t’ island appeals greatly to me. I loved Plockton on our one visit, but don’t remember the island. Is it owned? Can local children adventure on it? Great idea – wish we could implement something similar but too many of the specimens who would then be roaming would not be the ones wanted anywhere near! A lovely little meditation Seonaid! I hear that gorgeous isle singing to me! What a lovely shot. Thanks John….will you wade across?